Gala Bingo is one of the most recognised names in bingo, with lively bingo halls up and down the country. Online, this bingo site aims to replicate the bingo hall experience with plenty of exciting features. This Gala Bingo review will determine whether it’s worth signing up or not. If you’re new to Gala Bingo, you can take advantage of its welcome bonus. Once you’ve signed up, made a deposit of at least £10 and spent £10 on bingo tickets, you’ll receive a free £30 to play with. This bonus money can only be used on bingo tickets and has to be wagered four times before you can make withdrawals. Once you’ve created your Gala Bingo account, you’ll have 30 days to claim this offer before it expires. Once you’ve claimed your bonus, you’ll have seven days to use your bonus money before it too expires. One of the best things about Gala Bingo is its huge variety of bingo offerings. The site doesn't just offer 90-ball and 75-ball bingo (the two most common types of bingo), it also has 80-ball, 50-ball and 45-ball bingo.There are a total of 19 bingo rooms altogether, including some themed after popular TV shows such as Emmerdale, Coronation Street, The Chase and Deal Or No Deal? The bingo lobby is easy to navigate and well organised. Newbies shouldn’t find it hard at all to find the bingo rooms and the schedule of upcoming games. Searching for a particular bingo room is easy since the collection is split into different categories, plus there’s a search feature and you can sort them by most popular, A-Z and newest. 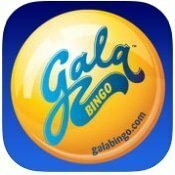 Aside from bingo games, Gala Bingo offers over 250 slots, many of which have progressive jackpots, and a good selection of over 35 table games, some of which are live. Gala Bingo offers a large number of promotions, much larger than many of its competitors. There are over a dozen bingo promotions, including many free bingo games, three slots and games promotions and half a dozen or so promotions linked with one of the invite-only levels of the loyalty scheme. Speaking of the loyalty scheme, it has a total of six levels, the last two of which are invite-only. The higher your level, the more bonuses and rewards you can claim. If that’s not enough, Gala Bingo has a VIP club which works in a similar way and offers amazing rewards for the most loyal players, such as VIP parties, special events, Free Bingo and more. Overall the promotions offering is well above average at Gala Bingo. It’s clear that a lot of effort has gone into giving players loads of opportunities to earn extra bonuses and rewards, which is great to see indeed. 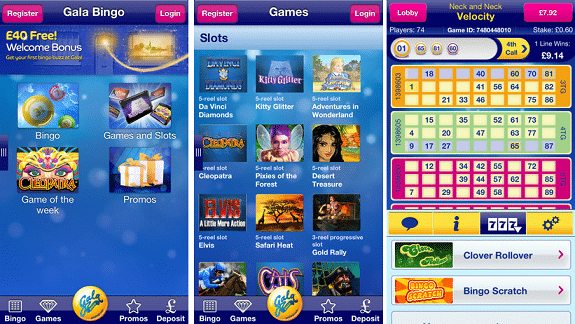 Just like the Gala Bingo website, the Gala Bingo mobile app is bursting with content and has loads to offer players. There are plenty of games available, as well as plenty of promotions and lots of other great features, such as a Gala Bingo club locator and the Happy Hub, which you’ll also find on the desktop website. At the Happy Hub you can find entertaining blogs, videos and articles on all sorts of topics. The app is available for Android and iOS devices and runs very smoothly on all devices that have one of these operating systems. Even though there’s a lot going on at Gala Bingo, with plenty of features trying to attract your attention, the app never feels cluttered in any way. It’s quite easy to find what you’re looking for and it’s definitely worth downloading. Gala Bingo’s range of payment options is very good. You’ll find you can use all the major payment options accepted at online casinos and bingo sites, along with a few less common ones. Gala Bingo doesn't appear to charge any fees for using these payment methods, though be aware that certain payment providers may impose fees of their own for carrying out Gala Bingo transactions. As for withdrawals, they’re generally quite fast. For some payment options, withdrawals are instant and for others withdrawals can take between 2-5 working days to reach you. On Gala Bingo’s website finding contact details is more complicated than it should be. First you have to click on Contact Us, which takes you to the Help Centre. There you have to select what you’d like help with. A number of pre-set questions with answers will then pop up. If none of these satisfy you, click on No beneath the question Did These Answers Help You? and only then will you see contact details come up. The Help Centre is quite useful, but some players would prefer to have contact details available straight away for convenience’s sake. Availability and typical response times aren’t listed. The Gala Bingo website is one of the biggest of its kind and it’s definitely worth checking out if you’re a fan of online bingo, or even if you're new to online bingo. It’s full of great content, with loads of games to try out and plenty of promotions to take advantage of. Be sure to sign up and claim your welcome bonus – with so many bingo games available at Gala Bingo, you wouldn’t want to miss out on £40 free to spend on bingo games. Simply sign up, deposit £10, spend £10 on bingo tickets than that free bingo money’s yours!